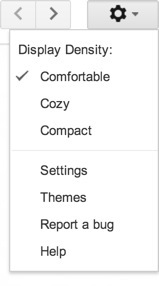 Choose Settings, from the Settings cog. 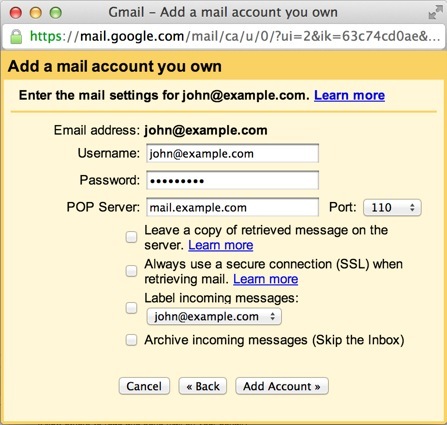 Click ‘Add a POP3 mail account you own”. 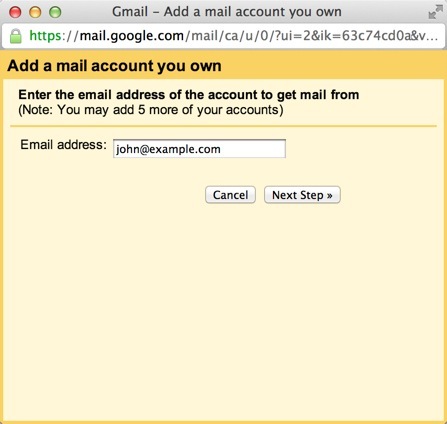 Enter your full email address as the Username. Enter Password for your email account. Enter the POP Server. This will be your domain name (example.com). Check “Label incoming messages” if you want this email address to be labeled as different from your Gmail address in the Inbox. 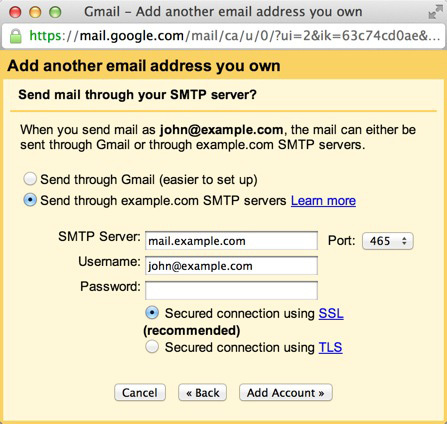 Enter the SMTP Server. This will be your domain name (example.com). Now check the code for verificationthat was sent to the email address you are adding ( since you have already added it in your Gmail account, it will be delivered to Gmail inbox ). Paste it in the corresponding field and click ‘Verify’. 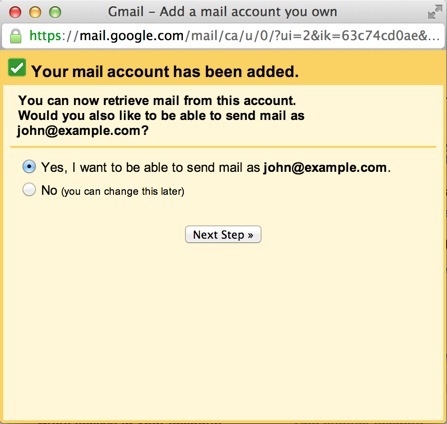 Now you can both fetch all the emails sent to your email address and send from it in your Gmail account. Let’s head back to the setting area (remember the settings link in the top right corner in Gmail). Once again click on the Accounts Tab. 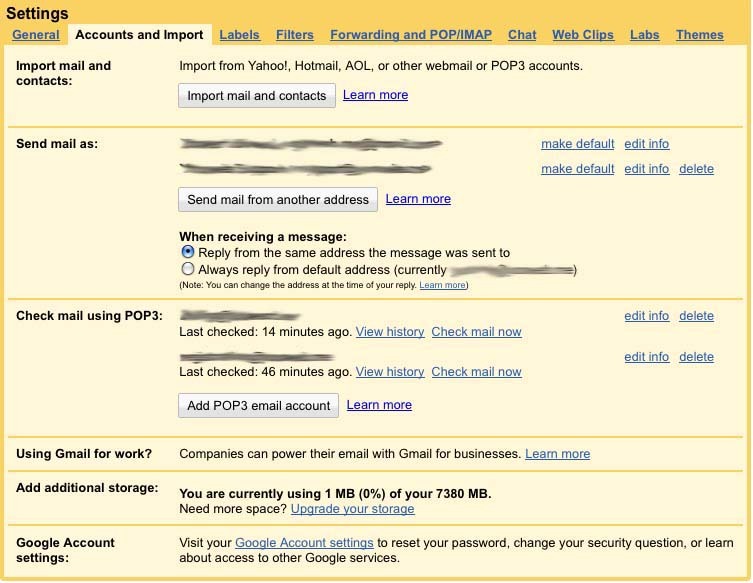 Which email address do you want to be your default? 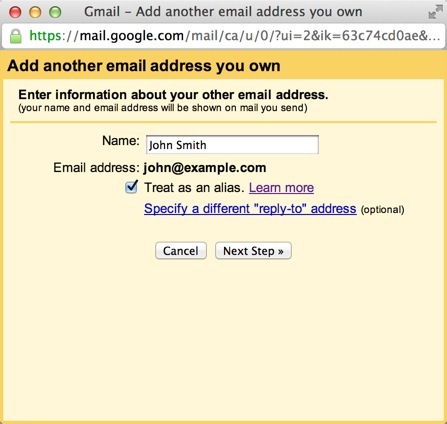 You can click “make default” if you would like to change that to your newly added email address. You will also probably want to change the setting under “When receiving a message:” to “Reply from the same address the message was sent to”. If you don’t change that it will always reply to people from your default email address rather than the same address they sent it to which in most cases you probably don’t want. You can always change which email address you are emailing from when you compose an email by simply clicking the dropdown menu on the “From:” line in your email.